German Longhaired Pointer is the rarest of the German Pointers. 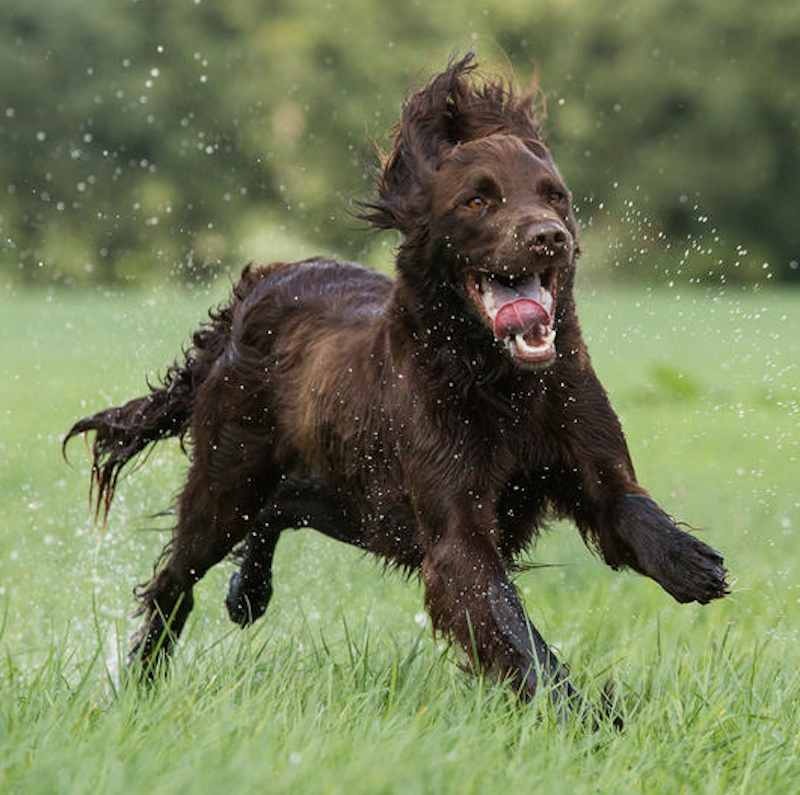 Bred as a sporting dog, the German Longhaired Pointer is active and possesses a fair amount of stamina and drive. The Longhaired German Pointer is closely related to three other long-coated German sporting breeds: the Large Münsterländer, the Small Münsterländer and the Wachtelhund, the last being similar to the English Spaniel. 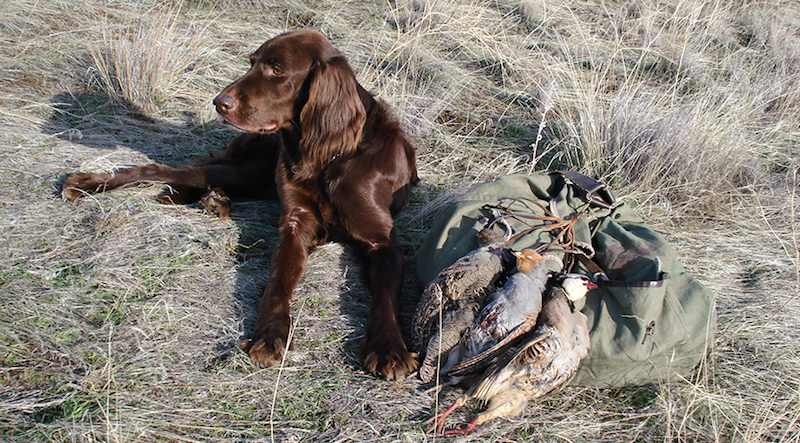 In outline, the breed resembles a rather heavily constructed setter. Some believe the breed first appeared on the scene around 1860 but other authorities contend the breed traces back to medieval times. 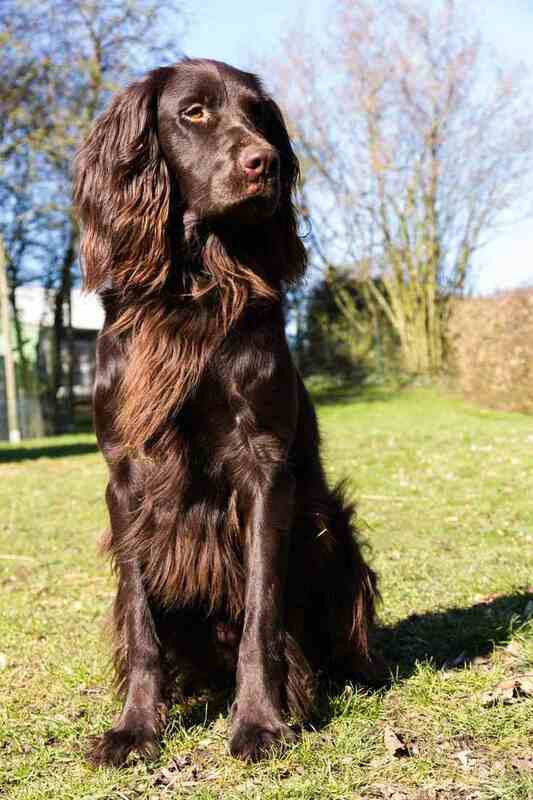 In Germany, the breed is still highly regarded as a versatile gun dog and family companion; however, the German Longhaired Pointer breed remains a rare dog breed. General Appearance: Strong muscular build, streamlined appearance. Massive and bearlike look is to be avoided. With lightweight dogs strong muscles are essential. Intelligent expression, noble and clean-cut outlines. Dogs under 22 inches (56 cm) and those with poor bone structure should not be used for breeding purposes. Coat and Colour: Great importance to be given to coat. The coat should not be excessive nor too short; on the back and the side of the body approximately 1 – 2 inches (3 – 5 cm) long. Underneath the neck, the chest, and belly, the hair can be somewhat longer. On the ears the hair is wavy and overhanging. Tail with good feathering. Backs of the front and hind legs are feathered, shorter on the lower running parts of the leg. Spaces between toes have dense hair growth for protection against rough ground. Protruding hair between the toes is not desired. On the head, hair is considerably shorter, but nevertheless longer than on a shorthaired dog. Overall, the coat should be smooth and slightly waved so that the dog is able to shake off water easily. The hair may be shiny, but not silky, and should be firm to the touch. The complete coat only develops fully after the first year of life, often still later. During summer the dog loses more than half of its winter coat. Colour brown with light spot on chest, white with patches and small brown spots. Head: Long, equally divided between skull and jaw. Slightly curved crown. Stop rising gradually, not abruptly cut in. Nose: Bridge of nose only slightly arched and not too narrow. Depending on the colour of the dog, the nose should be more or less brown. Nose not split. Lips not overhanging too much. Over-and underbiters should not be used for breeding purposes. Eyes brown, no light hawk’s eye. Eyes well closed, without visible red eyelid. Dogs with open eyes should not be used for breeding purposes. The eyes should be neither too deep in the skull nor protruding. Ears lying close to skull, broad at the skull, rounded at the bottom, inner edges covered with hair. Hairs on the ears slightly waved and overhanging at end of ear. Forequarters: The shoulder blade, the upper arm, the forearm and pastern should, when viewed from the front, be vertical when the dog is standing. Shoulders should lie flat against the body. The elbows pointing directly to the rear or at the most slightly outwards. When the dog is motionless and seen from the side, shoulder blade and forearm should form a 90 degree angle, but the forearm with the lower arm a flat angle (about 135 degrees). No steep pastern, joint only very slightly bent, yet not entirely straight. Body: Back has to be straight and strong, not overbuilt in front or back. Back should be strongly developed without sag. Chest should give the appearance of depth in comparison to width, no barrel-shaped appearance. Has to be deeper than the elbow joint, accordingly the abdomen must be correspondingly tucked up to give the hind legs sufficient room when running. Loins especially muscular. Croup should not be straight, but slightly sloped. Downwards hanging skinfolds on the flanks are to be avoided. The back determines the right proportions of the length to the height of the dog. Hindquarters: Seen from the back, the hip bone, the thigh bone, the shank bone and the metatarsus should form a vertical line. Well-angled hocks. Dewclaws may be removed. Toes well closed. Pads firm and strong. Tail: High set, either almost straight or slightly bent upwards. Should not be carried too high, but at least in the front part, almost horizontal. The tail tip should not hang forward. Good feathers, longest at the middle of the tail. Faults: Bushy eyebrows and long beard. ; Curly hair and curls. ; Red or black nose. ; Open eyes. ; Ears too long or too big. Leathery ends on ears. ; Cow-hocks. Bowed legs. ; Cat or long hare-paws. ; Curled tail. Disqualification: Black, red, and pure white with only little markings.